Are you newly-engaged and starting to plan the big day? First off, congratulations! Getting engaged and planning a wedding is an exciting time in a person’s life. Of course, it’s an equally busy time, as well. Between all the booking and planning, you might not have given much thought to your first dance. It may not seem all that important – but it plays a much bigger role than you may realize. Before the big day arrives, it’s a good idea to learn to dance for your wedding. Here’s why! There are all sorts of traditional and fascinating wedding customs. There’s the white veil reveal or the stepping on glass at a Jewish ceremony. At some receptions, there’s the cutting of the cake, a bouquet toss, or the breaking of bread. But the first dance of the newly-wedded couple is a tradition that not only has a symbolic meaning. It’s a custom that’s upheld across all types of weddings – no matter the setting, religion, or country. After the ceremony, guests will traditionally make way to the reception hall. They’ll cocktail, socialize, and await the formal arrival of the wedding party. In some weddings, the newly-weds will kick off the reception with their first dance. In other weddings, dinner happens first, followed by the first dance, and then the party. But the first dance is so much more than a formal start to a fun night of dancing and celebration. It’s one of the first things a newly-married couple does together… and it’s a big moment to make a lasting impression for years to come. How you dance can say a lot about your individual personality, as well as your partner’s. A slow and sweet first dance can set a romantic tone. Couples will often hold one another close and sway to a song. Others may wish to be extra formal by completing a waltz or tango. Some couples dance to a song that is significant to their relationship. For example, some couples may have a song they bonded over while dating. Other songs may have lyrical significance. The first dance can say a lot about the nature of your relationship, as well. Adventurous or humorous couples may opt for an upbeat or silly first dance. More reserved or older couples, on the other hand, may be more likely to do a slow dance. Some couples will perform dances that are custom to their home countries or religion. It’s not uncommon for couples to break away from the traditional slow dance. Some may wish to open a night of celebration to a salsa, bachata, or cha-cha dance. Other couples may enjoy swing dancing or square dancing. The first dance can also say a lot about the type of tone you’re trying to set for your wedding – and even your marriage. What type of atmosphere are you looking to create for your wedding? Do you want your guests to feel sophisticated in a conventional setting? Do you imagine everyone dancing, laughing, and having the time of their lives? Whatever your vision may be, you can set the tone for your reception during the first dance. A nice, slow dance could set the tone for an elegant and romantic night. Or, a fast, unique dance can inspire your guests to let loose and have fun. Your wedding guests will be traveling near and far to attend your big day. You’re already making the arrangements to ensure their day is as special as yours. Performing a strong first dance will make your guests even more excited to be there. Making your first dance a special, choreographed event is a way to set the tone for your marriage. Taking the time to learn something new with your partner demonstrates commitment. Learning to dance for a wedding is a great way to bond with your partner, as well. Planning a wedding – on top of everything else in your life – is by no means easy. You and your fiance may be feeling particularly stressed at this current time. What better way to unwind together than to dance the stress away? In fact, there are all types of health benefits to dancing. Not only does dancing eliminate stress. It promotes flexibility, weight loss, and can improve your memory. Taking a break from planning the wedding is important to the entire process. The less stressed you are, the better of a job you’ll do at planning. And the less stress you are, the happier you’ll be, of course. Plus, by learning to dance for a wedding, you won’t feel guilty about taking a break from planning, either! Which song do you want to dance to? How long do you want the first dance to be? What’s your vision for the first dance? What styles of dancing have you always wanted to learn? Give yourself plenty of time to learn to dance for your wedding. Not only will you have lots of time to practice and feel comfortable. You’ll also have time to incorporate harder, more intricate moves to your first dance. You may even decide to take a dance lesson with your parent. After all, there is the mother-son, father-daughter dance. Your first dance with your new husband or wife is something your guests will remember for years to come. It’s also an opportunity to demonstrate your love and commitment to your new life partner. 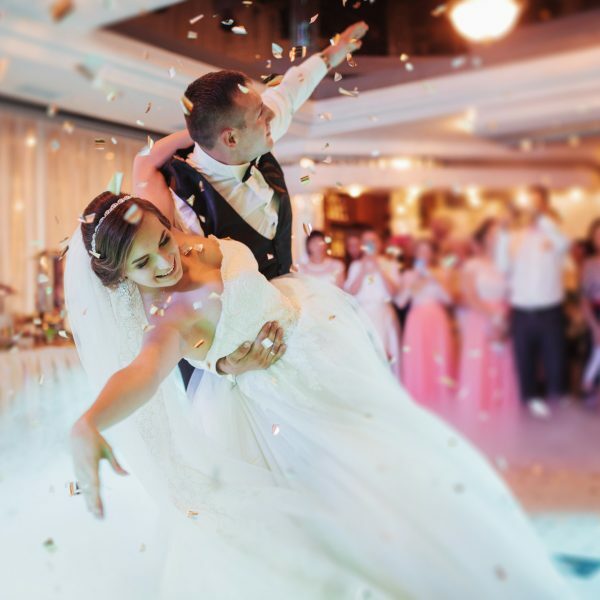 By learning to dance for a wedding, you can help make your big day all the more special… and it’s all possible with the right practice and guidance. A choreographer can help you create the perfect first dance – and so much more. Are you looking to learn to dance for your wedding in Illinois? Contact us today to learn more about how we can help you dance your way to the best day of your life!